You have a great product or service, but now your business success lies in your marketing. Content should be the heart of your marketing strategy. Through it, you’ll be able to educate and introduce your audience to new ideas, generate interest into a topic, or establish validation of a problem that businesses should be concerned about solving. Your content should be thought-provoking, inspire change, teach, and provide actionable, next-step recommendations. Content is most valuable as part of a multi-step campaign, and our Viewpoints are designed to fit into multiple stages within your campaign. The Ventana Research Viewpoint is short, opinion-based content piece that provides an introduction to a topic or problem based on the expertise of our analysts and backed by our independent research. Written in the voice of the analyst and only two pages in length, our Viewpoints cover a specific business and/or technology related issue that provides an entryway into a larger. It is designed both to create interest and educate readers on best practices and paths to optimal performance. We work with you to create a Viewpoint specific to your needs and goals. Created from a mutually agreed upon topic, we do the heavy lifting to create an Viewpoint that speaks to your audience using our expertise and only our own market facts. Your organization will have exclusive distribution rights to the Viewpoint we create during the licensed period. 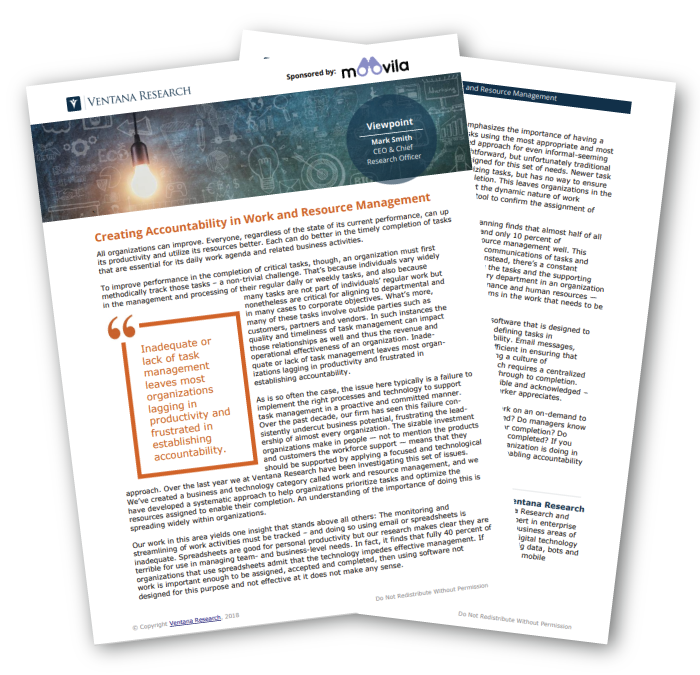 Organizations today must continually reassess their workforce management strategies and supporting technologies. They must do this both to maximize the value of a much broader set of kinds of employee data and to deliver the best possible employee experience, an objective that has become much more important over the past few years. More specifically, organizations must find an efficient way to convert all relevant workforce data into new sources of business value, and must have the capability to scalably personalize key aspects of a worker’s daily experience on the job and his or her pursuit of career goals. Enterprises that do this have the opportunity to be the leaders of their market segments going forward. • Can communicate the result to another digital system or create an alert. RPA systems can make organizations more efficient by “outsourcing” repetitive tasks to digital systems. Moreover, just as robots in manufacturing can perform repetitive actions more consistently than humans, RPA systems can improve the quality and accuracy of work and shorten cycle times. In cases where they enable skilled employees to concentrate on matters requiring their education, experience and judgment, they also can make an organization more effective. Organizations’ use of data and information is evolving as the amount of data and the frequency with which that data is collected both grow. Data now streams into organizations from a variety of sources such as social media feeds and internet of things devices. The ever-increasing number of devices and streams of data offer new ways to capture information about a business and improve its operations. If an organization doesn’t capture this information and utilize it, it would be analogous to running a business without recording its sales or capturing its expenses. We at Ventana Research project that within two years the collection and analyses of streams of event data will be a standard component of enterprise information architectures.